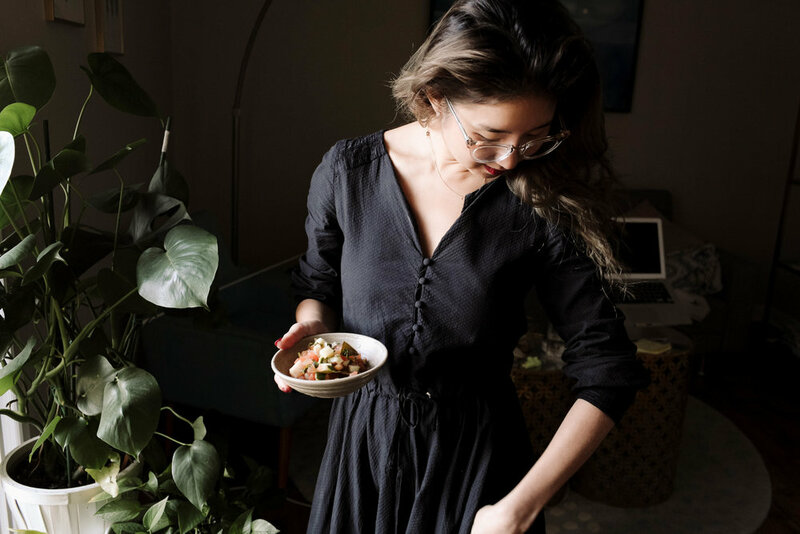 Shizu Okusa is the co-founder & CEO of JRINK, a direct-to-consumer wellness brand, with five stores in DC and a budding tech and subscription business, offering both on-demand and scheduled delivery. JRINK is well-known for their brand and healthful menu, offering glass-bottled cold pressed juices, nut milks, and superfood elixirs. Oh yeah & they are 100% women-owned! While we could go on and on gushing about Shizu's business, what we really #pinefor is her personal career-journey from finance to wellness. 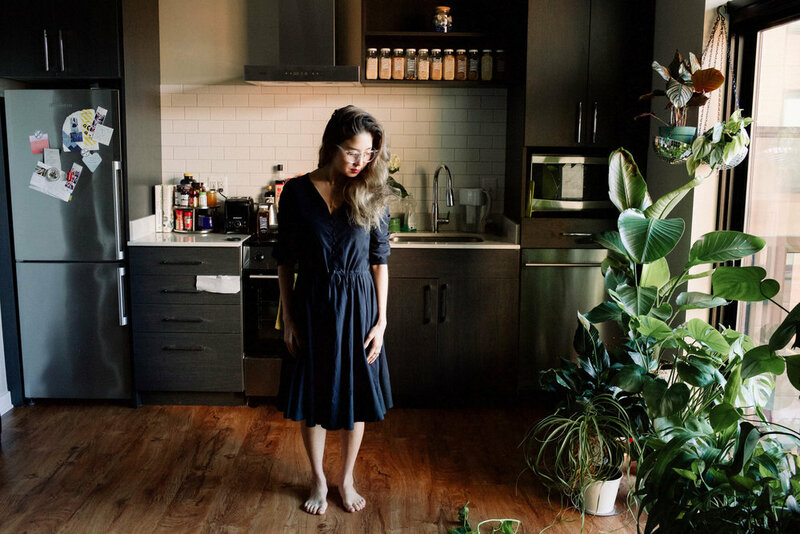 Shizu started her career on the trading floors of Goldman Sachs in New York, before she took a year’s sabbatical to travel the world, and later move to DC with a job at the World Bank. She spent a year in Mozambique, studied the intersection of spirituality and modern living, and then moved to Ubud, Bali to become a certified yoga instructor which fostered her fascination and appreciation for healthful living. 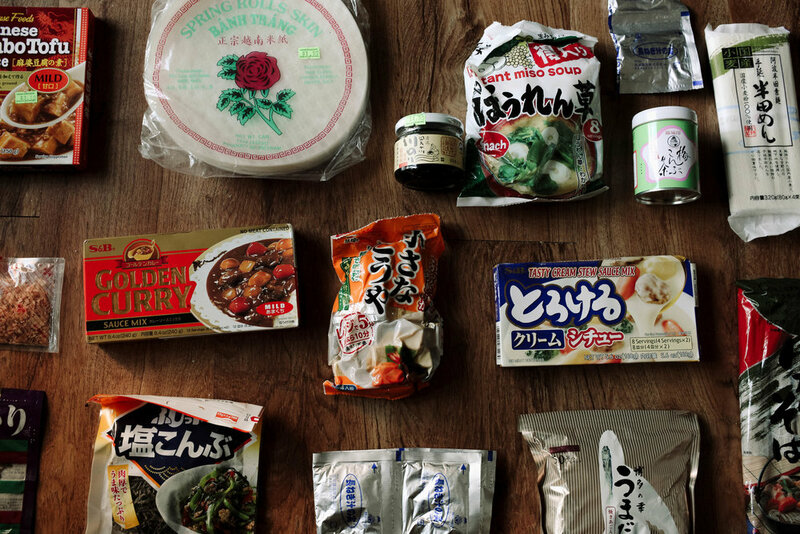 When we peeked into her pantry we saw a true reflection of her traditional Japanese upbringing, multi-global career, and values on hospitality-- we have a goodie bag full of Japanese products and pot-ware to prove it! Shall we begin? "There’s a Japanese term -- もったいない (“mottainai”) -- which essentially translates to “regret over waste,” and I try to live by that principle everyday. My lifestyle also reflects minimalism, with only one of everything and going to the grocery store to purchase only what I need for the next few days. My apartment has almost no furniture (yes, I sit on the floor for dinner, and yes, I take my shoes off upon coming home) and even my closet gets a cleanse every quarter. Call it monotonous but I use the same cutlery and dishware, do the same morning ritual and nightly ritual, and cook really simply. My kitchen works for me, not against me, so I can set myself up for success every day. 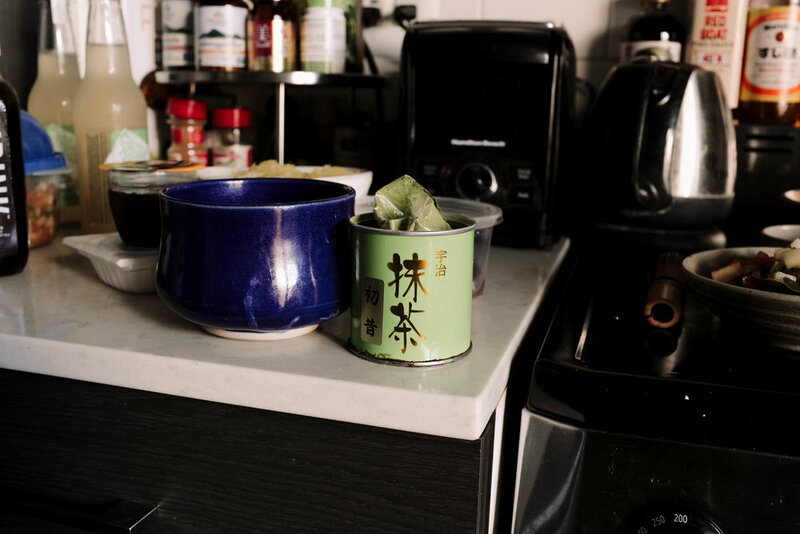 My kitchen is also a reflection of family and Japanese culture. My dad was a Japanese landscaper, and now a retired farmer and martial arts instructor. I grew up and spent a lot of time on a farm driving tractors and ploughing the field (probably the reason I left home at the age of 16! haha). 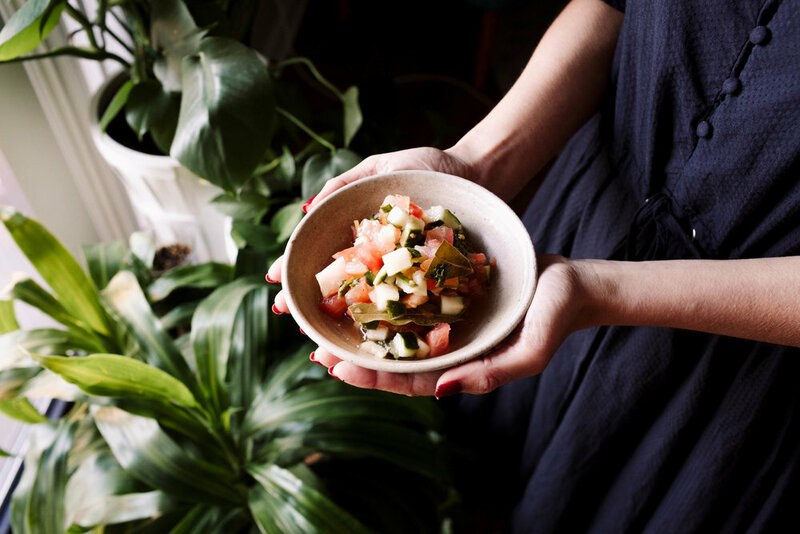 The benefit of farm living is space, eating what’s naturally grown in your surroundings, and being as environmentally sustainable as possible, including homemade compost and even reusing water (e.g. when washing rice, using that leftover water to water the plants -- they love it!). My mom is a potter so all of my plates, bowls and cups are her pieces of artwork. Everything is hand-made with care, unique in size and color, and fragile. Given my Monday-to-Friday lifestyle can be a bit chaotic, my schedule can be pretty up-and-down, it’s always grounding to wind down the evening with a nice hot bowl of soup or tea, using her pottery. It’s a daily reminder for self-care, to move slower, and a reminder that good things take time. I appreciate food for its power to heal. 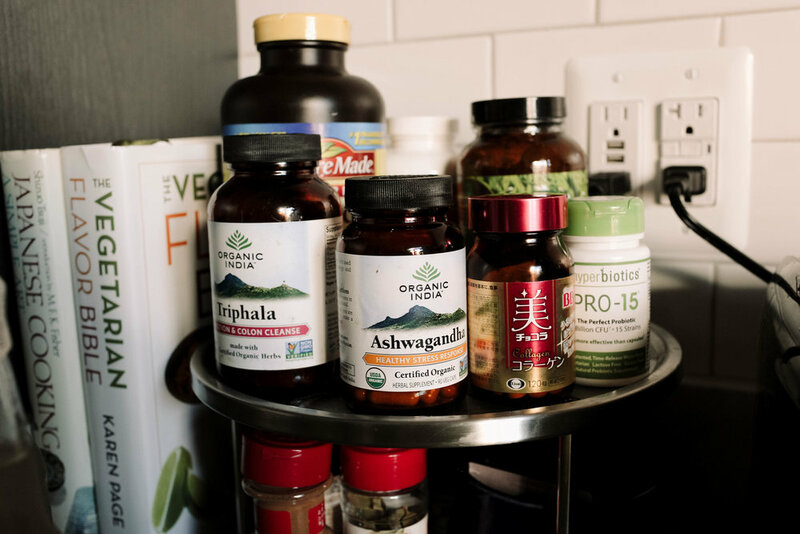 When I was living in Bali, I studied a lot about ayurvedic medicine and old East-Asian methods of naturally making ourselves feel great again. After living that crazy lifestyle at Goldman, one that consisted of a lot of coffee and takeout, I am almost certain that technology and work are outpacing our own physical bodies. We need to fight back, but in a sustainable way, without sacrificing our passions and ambitions for good work. So this probably sounds boring, or crazy, but personally speaking, I don’t seek out too much inspiration in the kitchen. I do rotate and change up my ingredients, based on season and location, though. For example, when I was living in Vancouver, a lot more seafood and locally grown greens. In New York, I flat out didn’t cook much so honestly there wasn’t too much to see in my fridge...maybe Ketchup for them late-night fries? In Mozambique, I had access to some amazing tropical seafood and fruits. In Bali, a lot more rice, greens and tempeh. In DC, less seafood and more tree-grown fruits and root veggies. So as I said, each location brings it’s own environment and foods that I can take, and make it my own. I know what I like, I know what works for me, and food is just that -- it’s personal. Why look for the next best thing, when what’s right in front of you is perfect as is? Honestly, I shop for foods that are convenient to cook, but never sacrifice taste. As much as I’d love to cook everyday, I’m not exactly in the stage of life where I (erm...insert “feel like I”) can. Instead, I cook or meal prep 2-3 times a week, for the week ahead. I am a big believer in fermented foods and actually make my own yogurt, to make Japanese pickles, and soups that taste better over time. If I don’t have time to make my own 出汁 or “dashi” (i.e. bone broth), then my go-to is Nona Lim bone broth. Ingredients-wise, I’m a big believer in eating for your body type aka “dosha”. In Bali, during my yoga training, I learned that I am a strong Vata or have qualities of “air” -- a thinner body type, creative (but sometimes all over the place) personality, and strongly needs grounding foods and essential oils. That means, a LOT of root veggies (potatoes, carrots), good fats (ghee, coconut oil, sesame oil), and warm soups -- they’re my yin (ground) to my yang (air), and help me stay grounded. All the fats -- ghee, coconut oil, avocado. 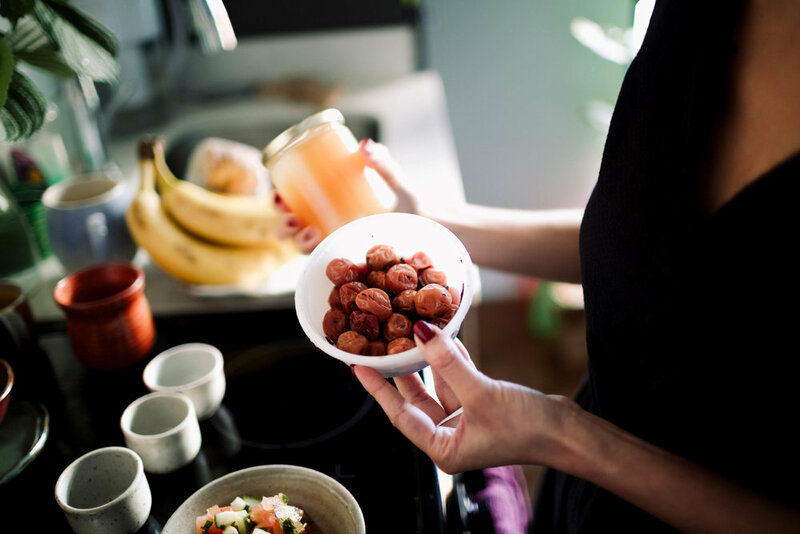 Gone are the days of avoiding fats. We need it to function, and for me, it “moisturizes” my digestive system and is grounding. I use ghee for my soups, coconut oil in my drinks (and on my skin), and avocados for stroking my millennial side -- toast. I admit it. As I mentioned I’m also big on fermented foods, so yogurt, natto (fermented soy bean) and miso are staples. Finally, I’m going to sound biased but shameless plug: JRINK’s all-green juice or Fuel Me Up 2. Liquid greens with no fruit to give me peace of mind nutrition, and easy digestion, when pressed for time. Apple cider vinegar, my dad’s farm-made honey, soy sauce, olive oil, almond butter, and as you can see, my JRINK-bottle lined dried goodies, which include things like cacao, lentils, rice, amaranth, oats, chia seeds, flax seeds and nutritional yeast. I use the chia seeds and oats for overnight oats, with our Build Me Up nut milk, and the lentils, rice, and nutritional yeast for some savory hug-in-a-bowl soup. My aunt is a tea ceremony instructor and she’s given me her “chasen”, which is the traditional Japanese matcha whisk. I use it every day for my daily morning matcha shot -- it keeps the caffeine high mild, longer, and slow releasing. It’s also very meditative so it’s a good pre-meditation to the actual meditation, which I try to do 10 minutes daily. Bowls, cups, plates are all hand-made pottery pieces from my Mom. Over the years, she’s gotten really good and one day, I hope to bring them to DC and sell them at JRINK stores! Finally, all of my cutlery -- chopsticks, spoons, forks, knives -- are bamboo or wood-made. In 2012, I also traveled to Yakushima, a small island and UNESCO heritage site in Japan, which is also known as “moss land"... Yes, you guessed it, it’s an island covered in ancient moss. Sounds mythical but it kinda was. I brought back a lot of my cutlery from that trip and use it (carefully) everyday. The smell of cedar is still there, it’s pretty amazing. 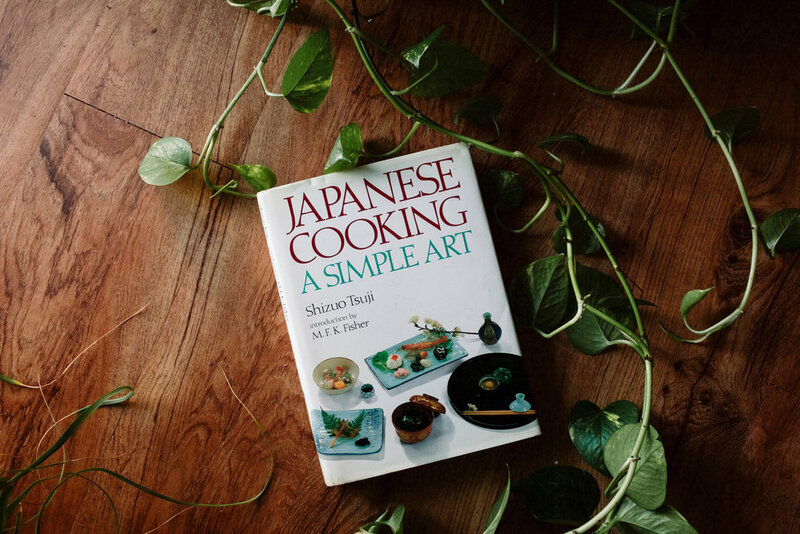 Because there’s not too many good Japanese restaurants in DC, I resort to my mom’s old recipes or an old Japanese recipe book I bought at Second Story Books in Dupont. An old friend also gave me a flavor cookbook, which I look to for sweet-savory flavor combinations. Love blending the two traditions of old Asian with new American." Hana’s Grocery Market at 17th & U. I was scared they closed down but luckily, they re-opened! Soupergirl Soups! We collaborate with her every Winter for a reason. I love Sarah as a person and her soups are deeeeeelish. Teaism’s salty oat cookies. Oh. My. God. You’re welcome, ladies. They say to surround yourself with people better than you, and I have the benefit of doing so with my team: Katherine (@kathacot) for dealing with my crazy ideas, Kallie (@queenofbacon) for her sense of humor, Nikki for (wo)manning our kitchen, and more.